When you head out for one of the many popular hikes north of Sandpoint, chances are you will end up in the Selkirk Mountains Grizzly Bear Recovery Zone, one of six such zones in the lower 48 states. 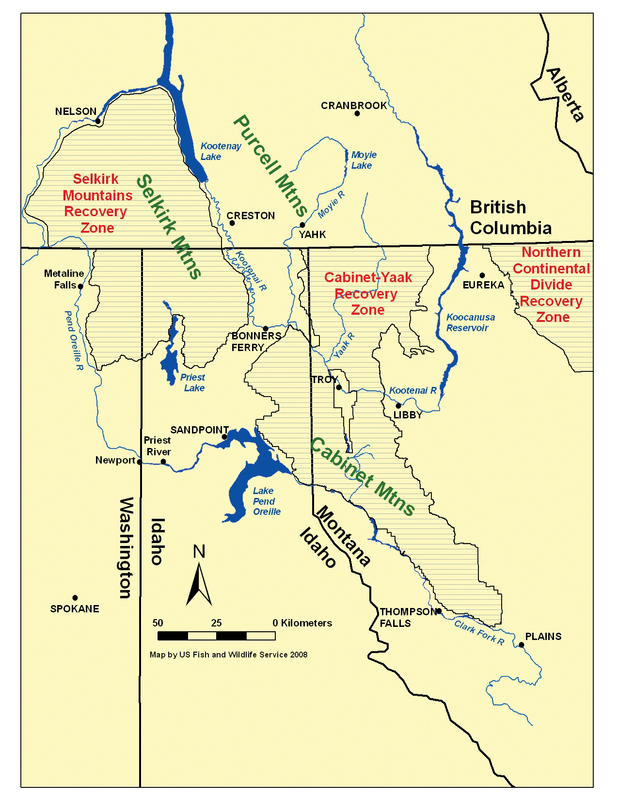 And if you’re headed across the lake to hike the Cabinets, then you’ll be in the Cabinet-Yaak Recovery Zone. Sandpoint’s not quite the epicenter of grizzly recovery in North America, but it’s definitely a major jumping-off point for areas designated as good for North America’s decimated grizzly bear population to make a comeback. These areas and four other zones in North America provide the best remaining habitat for these wide-ranging animals: They flourish when they have room to roam. (A story in last week’s Reader about Bog Creek Road in northern Boundary County touches on this issue.) The U.S. Fish and Wildlife Service estimates that there were 50,000 grizzly bears in the West at the time that Lewis and Clark first traversed it, but that number has shrunk by some 97%. As civilization spread westward, increasing human population shrunk bear habitat. We live near some of the last that’s left. While grizzlies have recovered to the extent they are being considered for delisting in the in the Yellowstone and Continental Divide zones east of us, grizzly numbers in the Selkirks and Cabinet-Yaak are only about half way to the USFWS goals for these areas, says Don Gay of Naples, a former USFS wildlife biologist who now works summers collecting grizzly bear DNA in the Selkirks. His work is part of a larger cooperative project that includes the USFWS as well as Idaho Fish and Game, Washington Department of Fish and Wildlife, Montana Fish, Wildlife, and Parks, and the Kalispel tribe, as well as agencies in Canada. Don will follow the bears wherever they go, and he’s gotten to know where that is. When he first started, he was given geographical coordinates to investigate. Later he worked with a habitat quality map to identify places to look for them. But “since then I’ve been more or less doing my own thing,” he says. He’s gotten tips from employees of the Idaho Department of Lands and from corporate foresters whose logging crews have seen or heard of grizzlies. They don’t conveniently follow trails. “I prefer easy places to hike, but there are a few spots that are quite spectacular for grizzly bears that there’s just not a trail into them,” he laments. One clue Don uses is “rub trees,” where bears have scratched their backs and left behind bits of hair. When he identifies a place where grizzlies have been, he might set up a remote wildlife camera along with a “corral,” which in this case is a string of barbed wire that grizzlies will have to cross as they pass through, leaving some hair behind. The cameras help identify whether the passing grizzly was a female with cubs. The number of females with this year’s cubs is a key figure for estimating the total population. Despite his efforts to go where grizzlies go, in all five summers Don has seen only two, both from his vehicle. 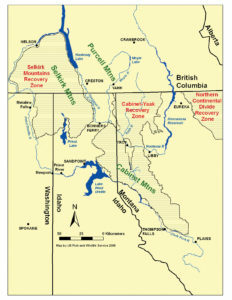 He notes that there’s evidence of a good density of bears along the Selkirk crest, although the population falls off west of Priest Lake. “There’s a lot of low-density habitat for bears to move into,” he says. 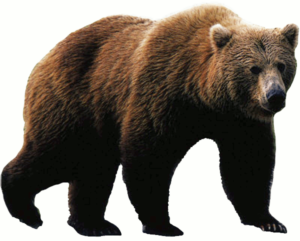 So just because you’re hiking in the Selkirks doesn’t mean you’re likely to see a grizzly bear. But there are those other bears. “This area is full of black bears,” says Don. They’re no more or less dangerous than grizzlies, and your chances of seeing one are much greater. You can find out more about how best to share the woods with both kinds at bebearaware.org. Cate Huisman lives in Sandpoint and writes frequently for local publications.